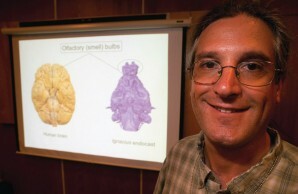 Florida Museum vertebrate paleontologist Jonathan Bloch displays images showing the different structures of the human brain and a primitive primate brain. Bloch is co-author on a study appearing in the Proceedings of the National Academy of Sciences that unexpectedly discovered that this early primate relied on smell rather than sight. 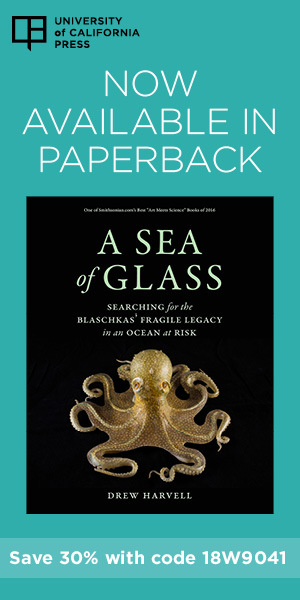 In previous research, Bloch and Silcox established that Plesiadapiforms were transitional species (see April 2007 issue). Ignacius was similar to modern primates in terms of its diet and tree-dwelling but did not leap from tree to tree like modern fast-moving primates. The mold suggests a “startling combination” of features in the early primate that requires a rethinking of primate brain evolution, said Florida State University anthropologist Dean Falk, who was not involved in the study. “Hypotheses about early primate brain evolution often link keen smell with nocturnal insect-eating, and a more recently evolved increase in visual processing with fruit-eating in arboreal habitats,” Falk said. The move to larger brain size occurred during an evolutionary burst that happened 10 million years after the extinction of the dinosaurs. At that point, visual features in the brain became more prominent while the olfactory bulbs became proportionately smaller. More than likely, Bloch said, this change in brain structure and size was related to primates living in closed canopy forests that brought trees closer together and allowed for more leaping. But answering that will require the discovery and analysis of new fossils. Changes in brain size and structure in the early stages of primate evolution have generated enormous debates for decades. But until now, fossil evidence has been lacking. Many models of the ancestral primate brain are based on tree shrews, which come from Southeast Asia and are distantly related to humans. But with some 70 million years of evolution between them and humans, “it turns out tree shrew brains are not a good model,” Silcox said. The early primate’s brain had relatively large olfactory bulbs, indicating the animal relied on smell rather than sight. “Being visually directed is one of the things that is a primate characteristic, but we can tell from the brain that’s not something that came in right at the base of primates but evolved later,” Silcox said. The fossil record provides the best test of inferences about brain evolution, but until recently, fossil evidence for primates has been mostly limited to teeth and fragmented jaws. But in last two decades, limestone deposits in Wyoming have yielded well-preserved skeletons and skulls.